The past week has been filled with everything but actual sports. From Lance Armstrong’s doping admission to Oprah, the MLS SuperDraft, NFL Coaching hires, and the Manti Te’o ‘catfishing’ story, all of the sports news has been about everything outside the field of play. Maybe that’s what makes Saturday and Sunday so great. Saturday was one of the best days of regular season college basketball match ups in recent memory. 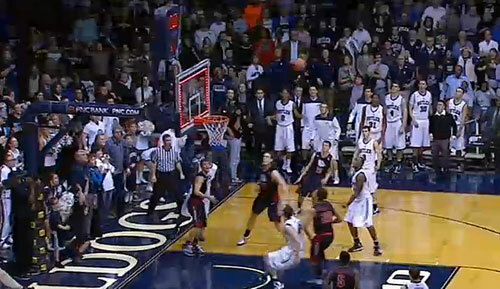 #1 vs #6, #10 vs #17, and it was to be topped off with #8 Gonzaga at #13 Butler. You know it’s a going to be a good day when ESPN College Gameday is at Butler and someone makes the half court shot for $18k…on the first attempt. The end of the day was even better. 10 plus hours later Roosevelt Jones makes a runner as time expires to win the game for Butler in an ending you have to see to believe. About 30 minutes before Jones’ game winner, Former UFC Light Heavyweight Champion Vitor Belfort TKO’d Michael Bisping at UFC on FX 7 in Sao Paulo, Brazil with a head kick. It’s a close call as to which crowd reaction was better. The one in Brazil or the one in Indianapolis. Then Sunday morning saw American Clint Dempsey get the tying goal for Tottenham in stoppage time against Manchester United in a snow storm. Dempsey was yellow carded for celebrating with supporters after the goal but he’ll take it and the point for Spurs. This is why we watch sports. For the unbelievable moments that can occur. The comebacks when all hope was lost. That rush of adrenaline into your system as you scream and jump up out of the chair. The rest, is to fill air time. Armstrong’s admission doesn’t make you forget the moments you watched over the years. The fake girlfriend of Te’o doesn’t make you forget the big plays he made during the year (or the tackels he didn’t make against Alabama). This is why we watch sports and why we will continue to watch regardless of the flaws these athletes have.